The largest, most dangerous storms generally strike in the afternoon. This is because energy in the atmosphere has time to build due to the heat of the sun. Beyond hurricanes or larger weather events, the worst thunderstorms often occur later in the day. Wild Backpacker reported that because of this trend, it may make most sense to head out for a hike in the morning. Not only can you avoid the possibility of a pop-up thunderstorm in the afternoon, but the earlier parts of the day will often be cooler and more comfortable. Ultimately the best way to avoid a dangerous situation is to cover your bases and account for the possibility of a powerful storm. This starts by monitoring the forecast before heading out and making an educated decision. If a thunderstorm appears to be immanent, it may be worth postponing plans until the next day. While out on the trail, keep an eye on the clouds, winds and temperature, as changing conditions can signal a coming storm. Plot the route of your hiking or biking trip and avoid key hazards if there may be dangerous weather in the future. Rocky Mountain Hiking Trails found that it is best to stay away from mountain summits or the top of hills, wide open areas or large bodies of water. 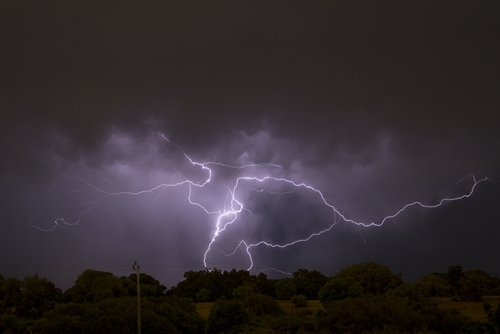 These areas will leave you exposed and vulnerable to lightning strikes. At the same time, strong storms can lead to flash flooding, so staying out of low-lying areas such as ravines or valleys is also critically important. With so many hazards, it really does pay to think twice about heading out on the trail if the forecast calls for a thunderstorm or two. The majority of the time a storm will pass without incident, but the possibility of an unsafe situation demands proactive thinking. If you do find yourself caught in a storm while hiking or camping, seek safety immediately. Your best bet is to find a covered shelter. Unfortunately, sheds or other small buildings may offer little in the way of protection from lightning or falling debris. Find a sturdy structure if possible and avoid any phones or windows until the storm has passed. A car or van may provide adequate protection. If you cannot get inside, Wild Backpacker stated that there are still ways to stay safe during a storm. While in the woods, find a stand of smaller trees that are covered by taller ones. A single outcrop of vegetation or rocks is too exposed and could attract lightning. In open areas like a field or dessert, find a low-lying area with some sort of cover. Do everything you can to not be the tallest target, but at the same time, avoid lying down flat on the ground. Again, it's also important to account for the risk of flash floods. For that reason, do not seek shelter in a dry stream bed or area where escaping surging water would be impossible.